An exercise bike is a low-impact yet highly effective cardiovascular workout machine. The resistance and duration of your workout are two exercise variables over which you have complete control. Varying one can change the other to help you find the perfect combination for reaching your goals, whether they are losing weight, building endurance or improving heart health. The intensity of your aerobic workout is one of the most important variables. If you exercise at an intensity level that is too high, you may not be able to cycle for your desired duration. If you exercise at an intensity level that is too low, the duration required to meet your goal may exceed your allotted time. According to the American Council on Exercise, a proper intensity level elevates your heart rate to 55 percent to 90 percent of your maximum rate. Calculate this by subtracting your age from 220 and multiplying the result by 0.55 and 0.90. Or, use the talk test to measure the resistance level. You are exercising at a correct intensity if your breathing rate is increasing but you can still maintain a conversation without gasping for breath. The other major variable is duration. Aim to pedal for at least 10 consecutive minutes. For health improvements, cycle daily for 30 minutes. To lose weight, cycle for 45 minutes every day. You can break up your session into smaller durations until you are able to consecutively complete your entire time. Keep your resistance level at a steady state during your rides and monitor your heart rate. If you are unable to reach your desired duration, decrease the resistance level and slow your pace. The resistance control on an exercise bike may or may not be labeled. On some bikes, resistance levels are signified by a number, which is adjusted by a knob or by changing the number on a computer. Other bikes have adjustable knobs that don't label the intensity level. One way to gauge your level of resistance is to determine how many revolutions per minute the wheel makes. At a low-resistance level, the RPMs should be between 80 and 110. At a heavier resistance, the RPMs should be between 60 and 80. If the computer does not display your RPMs, extend your right hand above your right knee and count the number of times your knee touches your hand during one minute. 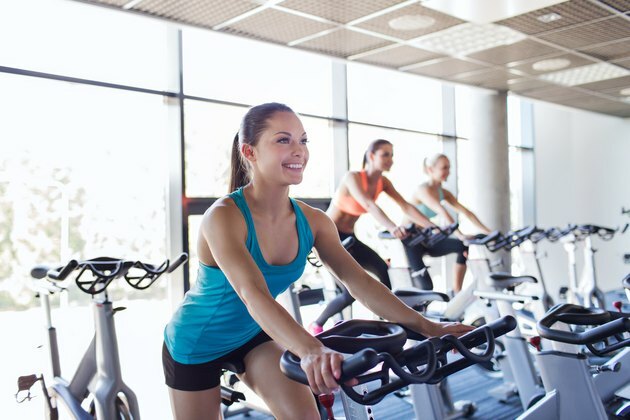 Most exercise bikes have timers that will count up or down to keep track of your time. You can change your exercise bike workout to suit your daily needs and goals by adjusting the resistance or the duration. Or you can monitor both variables and make changes within one workout for an interval training session. For example, after a five-minute warm-up at a slow pace with a low resistance, increase the resistance level and pedal hard for one minute. Then, decrease the resistance and pedal easily for two minutes. Continue the pattern throughout a 30- to 45-minute session.